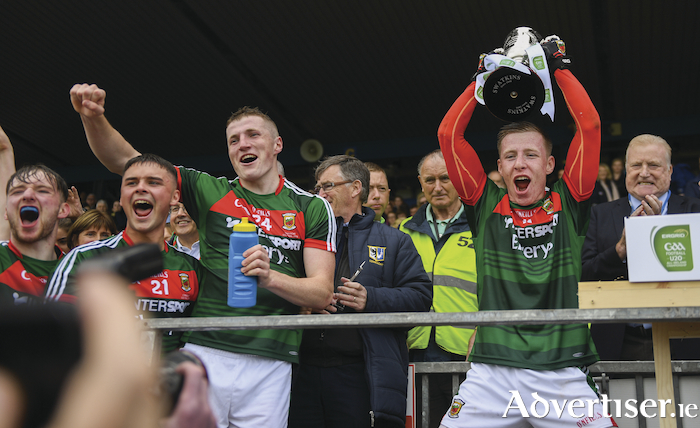 Captains Cup: Ryan O'Donoghue lifts the cup after Mayo's win over Roscommon. Photo: Sportsfile. Goals do win games and two goals in the space of as many minutes was the key to a well drilled Mayo winning the first ever Connacht u20 championship in Hyde Park. This was a keenly contested affair right up to the three quarter-stage of the contest until Mayo went from three points in front to ten points in a matter of minutes. Mayo were leading by 1-8 to 1-5 as the game entered the closing quarter, having led 1-5 to 1-3 at the break. After the restart both goalkeepers free taking ability was the main talking point, with Aaron Brady kicking two excellent long range scores for Roscommon, one from a free and the other from a 45. Mayo’s Patrick O’Malley wasn’t going to be outdone as he nailed a 45 for Mike Solan’s team - keeping Mayo that bit in front they needed to be. The vital scores of the game came just after the 45 minute mark - when Conor Diskin and Tommy Conroy found the net within 180 seconds of each other. Diskin’s score came after some good work by Paul Lambert who was excellent all day for Mayo in the number five shirt. Diskin finished well form close range for Mayo’s second goal to give them a bit of breathing space. That was followed by an excellent Evan O’Brien point from out on the stand side to put Mayo 2-9 to 1-5 clear and the coup de grâce was added by Tommy Conroy, who jinked his way down the left flank - before firing the ball home from close range and killing the game as a contest. Mayo kept their foot down and and kicked seven more points with Ross Egan kicking three, Paul Lambert two and Stephen McGreal and Colm Moran one each, with Roscommon only able to come up with a pointed free from Cian McKeon in responce. The first half was a well contested affair with both sides playing an open attacking brand of football throughout - leaving three men inside in their full forward line for the duration. Roscommon started the brightest with McKeon kicking the first two scores of the day - one from a free and the other an excellent long ranger from play. Mayo responded well with Ross Egan kicking four points in the opening half - three of them from play and Lambert getting his first of the day after a typical driving run down the flank. Mayo were leading by two on the 20 minute mark when Aidan Dowd slipped his way through three Mayo challenges and fired low beyond the reach of O’Malley to put Roscommon back into the lead. But Mayo kept plugging away and a goal from the penalty spot by Ryan O’Donoghue three minutes from the break - after he had been fouled himself - sent Mayo in leading by two at the break. Mayo: Ross Egan 0-8 (6fs ), Tommy Conroy, Conor Diskin, and Ryan O’Donoghue 1-0 each, Paul Lambert 0-3, Colm Moran 0-2, Evan O’Brien, Stephen McGreal and Patrick O’Malley (45 ) 0-1 each. Roscommon: Cian McKeon 0-4 (3fs ), Aidan Dowd 1-0, Aaron Brady 0-2 (1f, 145 ). Mayo: Patrick O’Malley; Johnny Maughan, Brian O’Malley, John Cunnane; Paul Lambert, Oisin Mullin, Cathal Horan; Jordan Flynn, Evan O’Brien; Nathan Moran, Ryan O’Donoghue, Oisin McLaughlin; Conor Diskin, Ross Egan, Tommy Conroy. Subs: Colm Moran for McLaughlin (41 ), Joe Dawson for Mullin (45 ), John Gallagher for Conroy (54 ), Stephen McGreal for Diskin (54 ), Sean Og Tigue for O’Brien (58 ), Brian O’Neill for Cunnane (60 ). Roscommon: Aaron Brady; Damien Duff, Luke Mollahan, Lorcan Daly; Aidan Dowd, Evan Flynn, Darren Nerney; David McManus, Eddie Nolan; Keith Murphy, Gavin Byrne, Dylan Ruane; Paul Carey, Cian McKeon, Brian Derwin. Subs: Gerry Galvin for Daly (28, BC ), Ciaran Sugrue for Byrne (28 ), Cian Corcoran for Ruane (49 ), Callum Fahey for Derwin (50 ), Michael Conroy for Nerney (50 ), Darragh Kildea for McManus (60 ). Ref: Barry Judge (Sligo ).